Christmas is a special time of year, when all of our league mates can come together and hit each other! To end our 2015 season, we created two special Santa-themed teams (Santa’s Pillage and Krampus Kreepers) of players from all different skill levels within the league, including skaters from both Fresh Meat and The Like OMGs. Our two terrifying and twinkling teams were determined not to go home with just coal in their stockings, but Santa's Pillage ended up walking off with the sugar plums of victory 231-149. The mixed-level bout of holiday-themed teams was not only to celebrate the season, but also to benefit the Haven Hills Women's Shelter. Proceeds from the bout were donated to the shelter and Winter Slay attendees were encouraged to bring much-needed items for Haven Hills. By the end of the night, $850 was raised and four large boxes were filled with toys, books, and other donated goods. 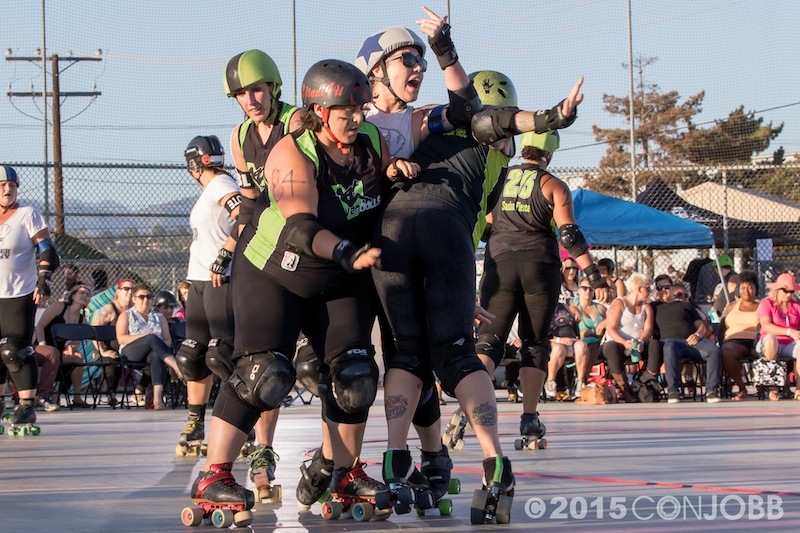 For the first bout of our league's last double header of 2015, the SFVRD Gnarlies took on their local rivals from Angel City Junior Derby. 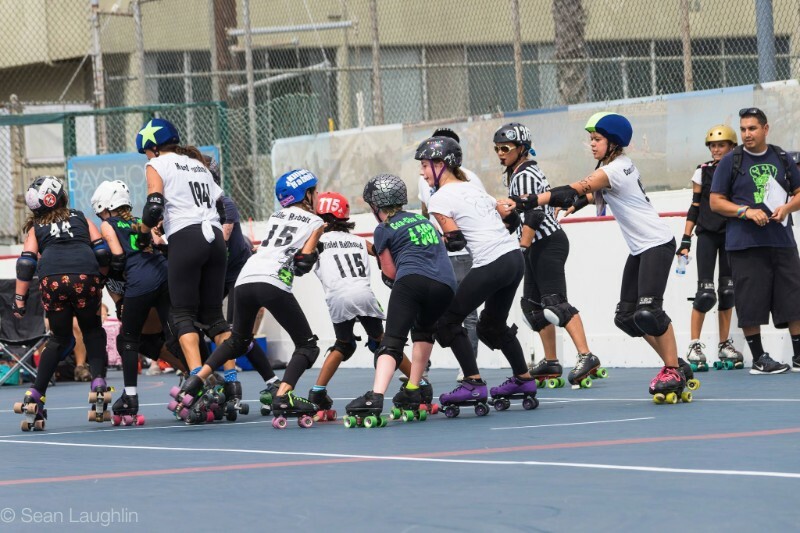 Angel City's nationally competitive junior roller derby program proved to be a force to be reckoned with and despite a valiant effort on the part of SFVRD's juniors, ACJD took home the win 369 to 129. Stay tuned for a rematch in 2016! 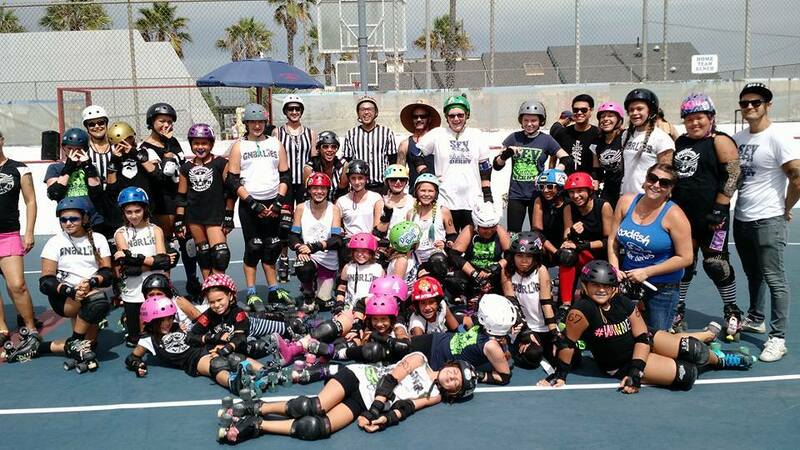 SFVRD's awesome Gnarlies started the holiday season off by heading into the desert to take on the Fabulous Sin City Junior Rollers. These girls may be young, but they sure know how to get down with their bad elves, giving out both velcro kisses and black and blue bruises! This month, the Wipeouts picked up a few of the Fer Sures and hit the road, heading out into the land of the Joshua trees to take on the Mojave Rattleskaters. Although the temperature plummeted when the sun set, the track was white hot with tons of SFV heat. Strong walls, killer strategy, and lightening fast jammers allowed the Wipeouts to gain a quick lead which they kept adding to throughout the bout. When the last whistle was blown, the final score was 75 to 219 SFV! 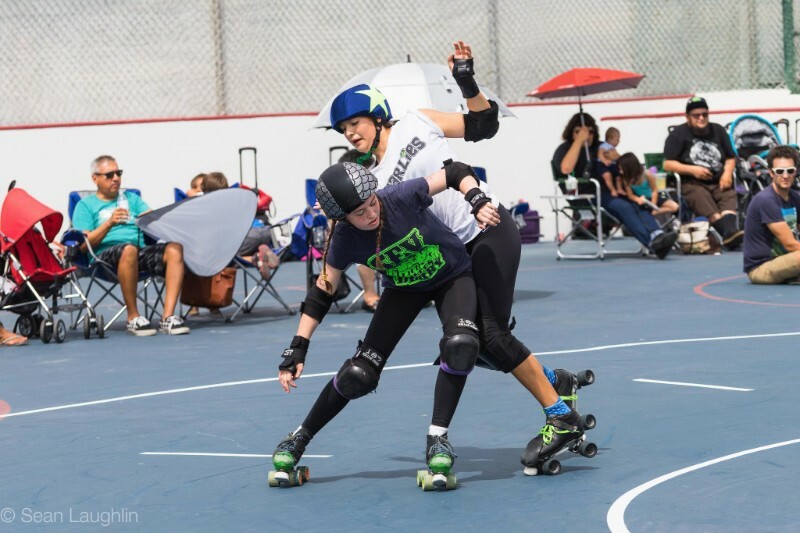 The Wipeouts finished off November with the home floor advantage against the Wasteland Derby Dames of Antelope Valley. Wasteland's defense had proved toxic to more than one league in 2015 and they were determined to show the ladies of SFV which Valley was full of truly unstoppable skaters. The Wipeouts, in turn, were ready to live up to their name and bring a tsunami of force to knock the opposing skaters off their wheels. Neither team backed down and an evening of awesome derby ensued with Wasteland taking the win 178 to 137.